Taiwan CZT Mina Hsiao’s simple 4Fun tangle was inspired, she writes, by jigsaw puzzles. I thought this tangle’s a great one for Hallowe’en week as its amorphic shapes reminded me of Casper the Friendly Ghost. And it is 4Fun, after all! 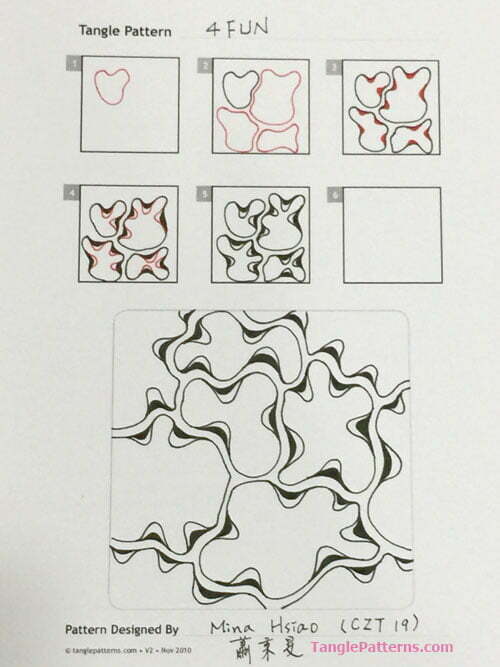 It is easy to draw and very engaging as you’re creating the curvy amorphous shapes then deciding where to put the solid black rounded shapes of Step 3. This tangle turns out different every time! When I start to draw the second or more irregular circles, each stroke must be along the other and can’t touch on it. It helps me focus more. Add smooth black shapes at prominent areas within the irregular circles. Benefit 4: magical, it’s fun! Here are Mina’s step-by-step instructions for drawing 4Fun with a large monotangle example. 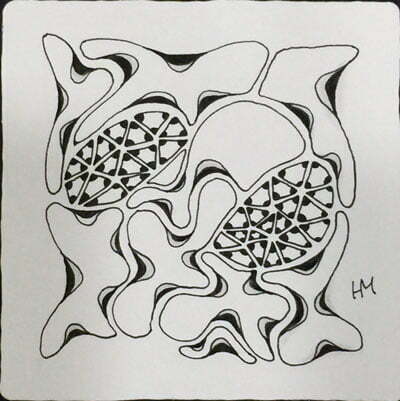 Mina’s lovely Zentangle® tile below also features the Zentangle-original tangle Tripoli. 4Fun is ripe for all kinds of additional tangles in the open spaces as demonstrated here by Mina. This looks like a fun carefree pattern. I am anxious to try it! Thank you for sharing! I love this so much I’m doing a Zentangle for my mom and this design is so fun. « CZT Michele Beauchamp’s “Today I Will Tangle” book is now available!